Gaining a better understanding of the quality of Radiata pine. For the past six years PF Olsen has been a shareholder in the research company WQI Limited. What's more, WQI has been a tenant in our office here in Rotorua over that period giving us a great opportunity to learn about and apply their leading-edge research results in our forest and harvesting management. WQI was established as a 1:1 funded research partnership between Government and Industry. The company's mission has been to develop commercial tools and technologies for segregating Radiata pine (trees near harvest, logs, lumber) based on wood quality features. It is common knowledge that Radiata grows fast and has good form but we also know it has highly variable internal properties which makes processing a challenge. 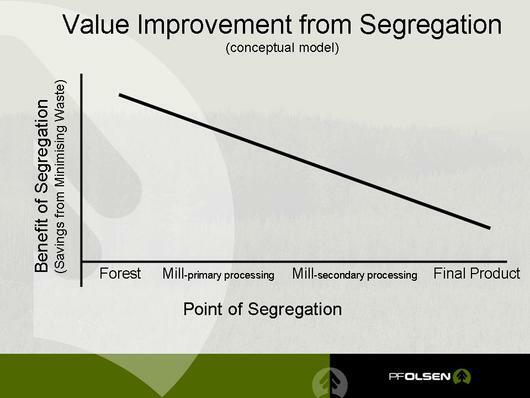 The value driver behind better and earlier identification of wood quality features (and improved segregation of logs or semi-processed product) is the elimination of waste. This waste arises when cost is incurred on a log or semi-processed product that is not suited to purpose and ends up being rejected or fails to meet end-use performance requirements. A simple example of this is transporting a log with insufficient density or strength to a structural sawmill, only to have it rejected and have to be on-carted to another mill or to the port. A more complex (and much more costly) example is processing a clear Radiata pine log into decking timber, only to have it bleed resin once installed in the deck and have to be replaced. The exhibit below shows a conceptual model of this situation and how segregation early on in the supply chain (e.g. in the forest) results in the greatest benefit as it has the greatest potential to eliminate waste. Conceptual model showing how segregation early on in the supply chain (e.g. in the forest) results in the greatest benefit as it has the greatest potential to eliminate waste. What properties are we talking about? Density and stiffness are important and are without doubt the key properties for structural applications. Research and development into these properties is well advanced and in routine commercial use. For example the Hitman is routinely used by PF Olsen and others in the field for the segregation of logs based on stiffness. The FibreGen ST300 does the same for standing trees. But there are other properties we need to be able to map in Radiata which also have a major effect on its utility, especially for appearance products. Resin defects (pockets, streaks, canals etc) lead the list as they are unacceptable in appearance products such as mouldings and finger-jointed/treated/painted fascia. WQI research has added considerable understanding to where resin is likely to occur, what causes it, how to assess stands for it's incidence and how to segregate logs based on the predicted level of resin defects. This type of information is being used by PF Olsen in recommending to clients whether or not pruning is advisable in various parts of the country. Another property affecting Radiata's utility is stability (commonly referred to as warp). Warp is particularly associated with core wood, but wood that has compression wood and large gradients (pith to bark) in stiffness or density is also more prone to warp. Warp affects the efficiency of processing Radiata (degrade to waste) and how our products compare with equivalent products made from other species (e.g. Ponderosa pine) in export markets. WQI has helped identify the causes of warp in Radiata and in doing so unravelled what has been a complex problem with an elusive solution. Lumber scanning technology is now being developed which will segregate Radiata into certified stability grades, something which has long been seen as the "holy grail" in this area. How to grow Radiata to increase the yield of warp free lumber will come from this research also. "When times are tough," observes Dr Keith Mackie, CEO of WQI Limited (photo right), "innovative companies invest more in R&D." Well times are certainly tough and PF Olsen is maintaining its long-standing support for companies like WQI Limited. These investments sustain key research capability which has been the backbone of the Radiata plantation resource in New Zealand and which will lead the all-important process of reducing waste and leveraging Radiata pine into higher value end-uses.